Safety in any repair facility should be priority number one. The best way to avoid injuries is by preventing them. Every facility should have an accident prevention program that combines best practices with employee awareness. In this article, we provide advice on how you can ensure your facility is safe and secure. We’ve also put together a Garage Shop Safety checklist that summarizes all the things you should review as part of a do-it-yourself safety inspection. Oil changes, transmission fluid changes, and other vehicle maintenance procedures involve working with slippery fluids that can coat the garage floor and increase the risk of accidents. Mechanics should clean up spills immediately when they occur, as slick spots increase the risk for slip-and-fall injuries. Anyone who works in a garage should wear boots with non-slip soles. Shop workers should always wear gloves to prevent chemical burns, chemical irritation, heat burns, cuts, and other types of injuries. These gloves should be left in the workplace at the end of each shift so that dangerous chemicals are not transferred from the garage to the home. Shop workers should always wear eye safety equipment when working with chemicals, welding, grinding, or performing any work that poses a risk of injury. Safety goggles should surround the eyes completely to prevent debris or liquids from entering the eye. Keep frequently used items in easily accessible areas. Any popular or commonly-needed items should be between knee- and shoulder-height to reduce strain when lifting. Heavy or oddly-shaped items should be kept above the elbow, near eye-level height, to prevent lower back and/or shoulder injuries due to improper lifting posture. It may be an old cliche, but making sure your workers know to “lift with the knees, not the back” – proper posture and technique is the easiest way to prevent injuries in the workplace. Make sure your workers are aware of the limits and regulations of all the storage equipment they use – weight limits, operating procedures, and so on. Perform regular safety checks to make sure all your equipment is operating properly and is safe and functional to prevent accident or injury. Redesign your floor plan as needed to provide extra room to work – keep the floor free of obstructions, make sure there’s ample space between different shelves to make sure everyone has room to stock and replace items, and make sure nothing is close enough to create a safety hazard. While seemingly obvious, the following general rules should be adhered to at all times in the shop to prevent accidents. Many accidents occur in the most seemingly innocent situations. Following these rules will ensure that no “accidental accidents” happen. such as fire extinguishers or fire alarms. Straighten or remove rugs and mats that do not lie flat on the floor. Use a ladder or step stool to retrieve or store items that are located above your head. assistance from a fellow employee. Do not tilt the chair you are sitting in on its back two legs. Do not stand in front of closed doors. solid object, if present, to maintain balance. Use provided aisles, walkways or sidewalks. Do not take shortcuts. Clean shoes of ice, water, mud, grease or other substances that could cause a slip or fall. 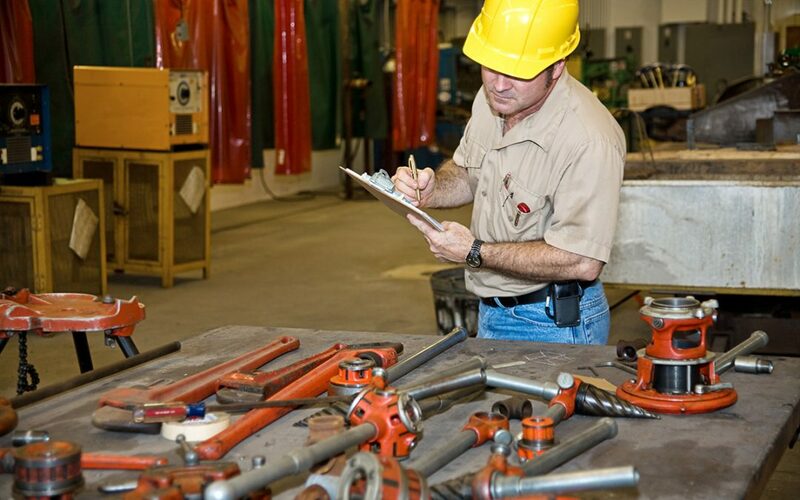 Proper training is one of the best ways to prevent accidents and injuries in shops. Every shop should have a formal safety training program that every employee must complete. The safety program should include information on wearing personal protective equipment, identifying workplace safety hazards, reducing the risk of electrocution, working with hazardous chemicals, and procedures for reporting safety hazards to management. Safety is an ongoing process that requires everyone’s participation. The tips we’ve outlined here are a good way to get started on implementing measures that will keep everyone safe. Don’t forget to download our Garage Shop Safety checklist. In the meantime, If you have additional questions, feel free to give us a call at (800) 922-6527.